Plans to build a £200m Center Parcs holiday village in Bedfordshire have been given the go ahead. Planning permission was granted by the Department of Communities and Local Government for the woodland site at Woburn - overruling a council decision. Center Parcs appealed against Mid Beds District Council's decision to reject the plan as it uses greenbelt land. 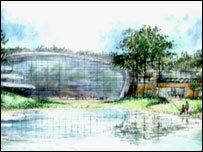 The new village, which Center Parcs has said would benefit the local economy, is due to open in 2010. The firm, which already has holiday sites in Nottinghamshire, Suffolk, Wiltshire and Cumbria, plans to develop an area of land currently used for commercial forestry. Center Parcs Warren Wood will create 1,400 jobs at the village which will have forest lodges, a hotel and spa and activity centres, the firm said. Martin Dalby, chief executive of Center Parcs, said: "The new Center Parcs village will generate significant local economic benefit including the creation of new jobs and further investment into the region. "It will attract a greater number of visitors to local sites and amenities in and around Bedfordshire." Planners at the council said if greenbelt land was built on, it would set a precedent for building on land in the rest of the country. However, Center Parcs appealed against the decision and a public inquiry was held. The council's decision was overruled by the secretary of state for communities and local government who said the building on green belt land was justified under "very special circumstances" due to the advantages to the economy, ecology and tourism of the village.